Hello, Fluffsters! With this post, I’m DONE WITH THIS CHALLENGE! BWAHAHAHA! Because of that, I’m turning “finishing” into my boring thing I’m writing about as comforting. It’s seriously a comfort to be done with finishing stuff. Seriously. And this week, I’ve finished (or will have finished) a lot of things. I got a lot of paperwork turned in so that I’ll be making money this summer (yay! ), I’m going to be finishing a class in literature, I’ve just finished a paper, and all sorts of other things. Those are now no longer hanging over my head, and have freed me up to think of random questions! And other topics! So, I do have a question. What would a bird bath for Phoenixes look like? Would it still be water? Or burning oil? Also, if there are emergency defibrillators, are there normal defibrillators? And do defibrillators remove all deceptions, or just minor ones? Anyways. I hope you have a wonderful weekend! Happy Friday! This entry was posted in NaBloPoMo, pointless, procrastinate, question, real world, Webmaster and tagged NaBloPoMo, pointless, webmaster on May 31, 2013 by Webmaster. Hello, Fluffsters! Happy Thursday! Hooray, just one more “comfort” post after this one! AKA, 5 important things about breathing. The first reason is obvious. 1) If you don’t breathe, your lungs start a civil war. That’s right. Keep your lungs happy. Don’t start wars. Breathe. Empty lungs start civil wars. Within your body. The lungs and the brain have an epic show-down. Lungs say: “Yo, brain! Give us some air, or we kill you!” And Brain is like, “Yeah, maybe, but I dunno.” And Lungs are all like “Fine! I’ll KILL YOU!” And Brain is all like, “Wait, what? No need to actually get violent.” And Lungs say, “You have been warned! We have now DESTROYED SOME OXYGEN! If you don’t cooperate, YOU’LL BE NEXT!” And Brain says, “Ack! I didn’t mean it! Don’t give me Carbon Dioxide Poisoning! Here, you can breathe!” and that’s how the civil war ends. And if you’re not careful, the liver will get involved. And your spleen. 1b) If you don’t breathe, you don’t live very long. This, in my mind, is a problem. …Thanks. I’m glad you agree that not-dying is a good thing. 2) If you do breathe, your lungs are happy. And if your lungs are happy, they form alliances with your brain, and your happy hormones. And stuffs. So happy lungs = happy you. So breathe, and make your lungs happy! Seriously. Why. Do. I. Try. Webmaster, what are you even thinking?! Uh, “thinking?” Define this “thinking” you write of? …You know, that actually explains a lot. 5) If you don’t breathe, your lungs and nose and mouth stop talking to each other. And you have no idea about resolving conflicts between those three! It’s an absolute nuisance. Breathing keeps them communicating with each other, which is comfortable. So there you go, Fluffsters! Reasons why the boringness of breathing is actually comfortable. And don’t forget, I’m really, genuinely looking for feedback on my new CafePress store! Please? This entry was posted in list, NaBloPoMo, pointless, real world, Webmaster and tagged craziness, list, NaBloPoMo, webmaster on May 30, 2013 by Webmaster. Anywho. Today I’m talking about drinks. Specifically, coffee drinks. And cafeterias. There’s something comforting about either a hot drink on a cold day, or a cold drink on a hot day, isn’t there? Well, anyways. I’m currently at a place with a cafeteria. And right now, I’m loving that cafeteria for one big reason: You can make Mochas. Here’s how it works. You see, they have pre-paid coffee. (Yes! Free coffee!) And during lunch and dinner, they have ice cream and (even better) caramel and chocolate syrups. Like, the thick syrups. So, I’ve been taking a cup, pouring a lot of ice into it, pouring milk on top of that, coffee (preferably the stronger flavor) and then a scoop or two of the syrups. And that is both a dessert, and refreshing. It’s fantastic. By the way, I’m still looking for feedback for my new CafePress store. Thoughts? This entry was posted in food, NaBloPoMo, Webmaster and tagged food, NaBloPoMo, webmaster on May 29, 2013 by Webmaster. As you may recall from yesterday’s post, I’m turning this week into a series on boring things that I’m calling comfortable for the sake of the “comfort” challenge. So, remind me why you signed up for it? Because I thought it would be a good idea… I didn’t realize how boring it would get. Or that my target audience is so totally different from the usual readers of those sorts of things! …So why are you still doing this? Well, I’m not going to stop with 4 days to go! Anyways, I have a few ideas that will work for these posts. T-shirts are comfortable for multiple reasons. 1) it’s good to wear clothing. It can be cold outside. T-shirts help protect your skin from weather. Going without a shirt would just be awkward, too. 2) T-shirts can be loose, and nobody cares. It’s a t-shirt. The only thing people care about with t-shirts is whether it says something cute or is a good color. Lime green, for example, is seldom a good color for a t-shirt. Just FYI. 3) They can be light-weight or heavy. If you get a light weight t-shirt, it can be a much cooler garment than other types of shirts. If you get a heavier one, it can be warmer than others. 4) No buttons. Self explanatory. And this topic was a nice segue into another topic: I have opened a CafePress store! Right now, everything in it is on sale. Prices on most of those items will be going up a bit on Saturday. But here’s where you come in: I want feedback. What sorts of things do you want to see in my store? More quotes? More images? Do you have a quote you want me to turn into a t-shirt? A favorite blog post you want me to turn into purchasable format? I want your opinions, Fluffsters! I look forward to hearing from you, Fluffsters! And again, Happy Tuesday. This entry was posted in CafePress, clothes, list, NaBloPoMo, real world, Webmaster and tagged clothes, list, NaBloPoMo, real world, webmaster on May 28, 2013 by Webmaster. Good news, Fluffsters! Only 5 days left in the “Comfort” theme. In honor of this being the last week, I’m going to be doing a series on things that are normally boring, but that I’m calling comfortable for the sake of fitting the theme. So yesterday’s was Socks. Today, I’ll be writing about towels. …At least you’re being honest. There are a few things that make a towel comfortable. 1) fluffiness. A towel is more likely to be comfortable if it’s really fluffy. Of course, that might also lead to clogged drains in the washer, which can lead to flooding in the laundry room, and therefore wet socks the next time you go out to check laundry, which leads to a cold and pneumonia and none of those things are comfortable. But at least your towel’s comfy! – And softer is usually more comfortable. For things like that. Once again, it would not be comfortable to use a soft knife. 3) Length / size. Bigger is better. ’nuff said. So, there you go! Here’s the second boring thing that I’m calling comfortable in this series. And what about you, Fluffsters? What’s your most comfortable towel like? This entry was posted in NaBloPoMo, pointless, real world, Webmaster and tagged NaBloPoMo, pointless, real world, webmaster on May 27, 2013 by Webmaster. D’you know something else that’s comfortable? Socks. I love socks. As long as they’re fun, that is. For example, I have about five useable pairs of socks that I love. Two of the pairs are (according to the label) knee highs. One pair is bright hot pink(!) and the other pair is white with different colored hearts on it. I also have some “seasonal” socks, but that doesn’t stop me in the spring. You see, they’re penguin socks. And really cute! Penguins are like owls, but they can’t fly. And they’re located in a slightly colder area. My other two pairs that I really like are Muppet themed. The green pair is, of course, Kermit themed. The other (a bit to my surprise) is Animal themed. I am a bit surprised that they aren’t Miss Piggy, but that’s fine. I really like them! What about you, Fluffsters? Do you have a favorite pair of socks? This entry was posted in NaBloPoMo, pointless, real world, Webmaster and tagged NaBloPoMo, pointless, real world, webmaster on May 26, 2013 by Webmaster. Hello, Fluffsters! Happy Saturday! Are you having a good weekend? Where I am, the weather was amazingly comfortable yesterday. It was in the 40s-50s. But what about you? Do you prefer warmer or cooler temperatures? Which are more comfortable? This entry was posted in NaBloPoMo, pointless, question, real world, Webmaster and tagged NaBloPoMo, pointless, real world, webmaster on May 25, 2013 by Webmaster. Thunderstorm!! And Dream House Thoughts. There was a (small) thunderstorm or two yesterday afternoon. That made me happy. One of my favorite things to do is sit in a window-ledge when it’s storming outside, and maybe reading a book. There are few things more comforting than having a good book, comfy pillows, and maybe a mug of hot chocolate (which I didn’t have) while watching the storm come down outside. A fluffy blanket is also good. So, my window ledges are awesome. There’s a place I can go to that has delightful trapezoidal windows with a nice ledge that’s quite wide enough for sitting. When I have a house of my own, I really hope I can get a nice window ledge (or three!) like that. Especially up just a little bit. Being able to look out over some stuff is really cool. Sort of like what I imagine being in a climate-controlled castle would be like. (Ooh, look! Alliteration!) If I do get a window ledge like that, though, I also really want to put in real cushions. Make it sort of a couch-y thing. And maybe have a slightly straighter place for a backrest. That’s not too picky, is it? I wasn’t actually asking you, Fluffy. I was asking our readers. So, fluffsters, I have two questions for you: 1) What is your most comfortable place to be in a storm, and 2) what is one feature your dream house has? This entry was posted in NaBloPoMo, pointless, real world, Webmaster and tagged NaBloPoMo, pointless, real world, webmaster on May 24, 2013 by Webmaster. I was out enjoying nature today, which is comfortable for me (see how I pulled in the theme? 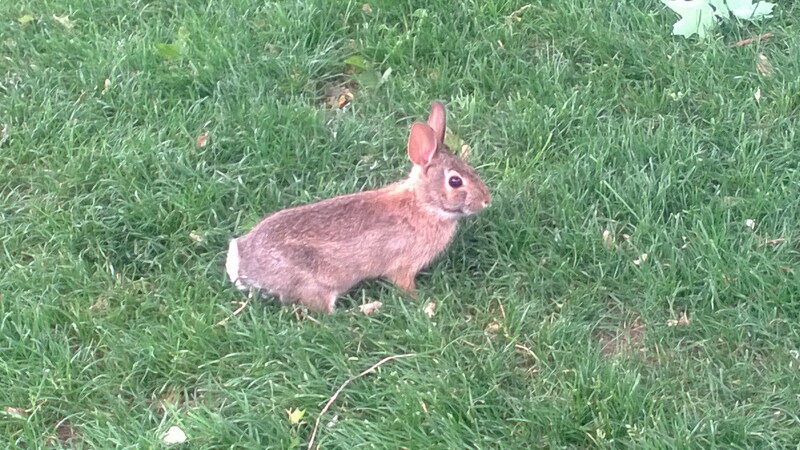 ), and I (almost literally) ran into the most adorable bunny rabbit I’d seen all day! I wasn’t able to get a good photo of it being extra cute, but it ate a dead leaf, and some dandelions, and it was just adorable. You’re hopeless, you know that? Anywho, Fluffsters, happy Thursday! Just think, it’s almost Friday! You can do it! This entry was posted in ANIMALS!, NaBloPoMo, pointless, real world, Webmaster and tagged animals, NaBloPoMo, real world, webmaster on May 23, 2013 by Webmaster. Less than 10 days left in this theme-challenge! Yes! Anywho. I’m going to list a few things that are comfortable, because I’m sortof not thinking of anything else to write, at the moment. Seriously, do you have to prove yourself wrong all the time? Probably not. I just don’t want to be sued for false information! Shh! Don’t scare them off! Anyways. As I was saying. Another thing that’s comfortable is lotion. Especially if it’s high quality. And not too slimy. And when you’re not then going to be either eating an apple or opening a door. Although I guess that if you’re eating, it’s still comfortable. It just tastes nasty. A smiley? You actually used a smiley? Did you seriously just say three things over the course of four questions? That takes talent, Fluffy! 3) Velvet. I love high quality velvet. It’s so soft and squishable! And smooth, and just soo comfortable to feel and hold and wear and, yeah. So, what about you, Fluffsters? What’s something you find comfortable that’s not on this list? This entry was posted in list, NaBloPoMo, pointless, Webmaster and tagged list, NaBloPoMo, webmaster on May 22, 2013 by Webmaster.